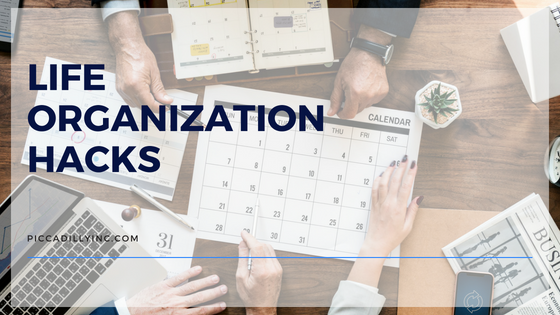 One of the key characteristics of successful people is their ability to stay organized in an increasingly disorganized world. For most, being more organized will make it onto the list of things we would like to see more of in our lives. Organizing can bring peace to the hectic schedules of our day to day lives and increase the amount of time we have in our day for leisure activities and self-care. If you’re one of those people who can’t seem to stay on top of your to-do list and everyday tasks, there is hope! We’ve put together a list of our favorite organization hacks to help you on your journey to a more organized life. Keeping a notebook or journal is one of the best ways to stay organized. You’ll also find that your head will feel clearer because you won’t be struggling to remember everything you need to do for the day, month or year. A journal is an excellent way to organize and prioritize tasks and you’ll be able to reference what you’ve got going on quickly and easily throughout the day when you’ve got it written down. Adding a calendar to your journal is also key to staying organized. Set deadlines for tasks you want to complete so that you’re more likely to complete them in a timely manner. Adding your schedules to your journal can help tremendously with time management, especially when you’re responsible for multiple schedules such as your bosses schedule or the schedules of your children. Setting up your calendar in your journal makes it easy to reference, adjust, and reorganize when needed. Clutter has the tendency to creep up on us over the years and when it comes time to declutter the process can be overwhelming. Don’t expect to declutter your entire house overnight but break down the house into manageable sections. An easy rule of thumb to avoid hoarding items you don’t need is the “6-month rule.” If you haven’t used or looked at the item in question in the last 6 months it’s time to toss it! You can also choose to donate items that others might be in need of for a tax deduction at the Salvation Army or your local thrift shop. Learn how to distinguish between needs and wants. Sales and bargains have the innate ability to pull us into buying things that we don’t actually need just for the sake of the “deal.” Unless you actively need the product or service that’s on sale it’s wise to avoid buying sale items just for the sake of getting that killer deal. Chances are your bargain items that you don’t necessarily need will end up at the bottom of the closet waiting for your next round of decluttering. Procrastination is one of those qualities that many of us are plagued with. Procrastination should be viewed as a snowball, the longer it rolls the bigger it gets. Instead of letting the snowball grow into an avalanche, put thoughts of procrastination out of your mind and tackle the task at hand. Once completed, you’ll be relieved that you didn’t put it off and more often than not you’ll end up with more time to spare than if you put the task off until later.